barh2_0's review (This content has been automatically translated from French)" Unlikely"
An aluminum housing and switches well beefy. Surprising. Entrance, exit and an entry for an expression pedal. There must hang a bit! Colour: 3-step Bright / Dark / Warm for the general tone of the preset gain previously selected. Warm attention mode, that saturates even clean. Tone: refining the tone, very effective. Mix: ratio adjustment stage output gain-stage output effect. As its name suggests, adjusts his crude metering / modulated sound. Amount: button tote. In reverb, it adjusts the depth, pitch, it sets the offset (from -3 to 4 tones), tremolo in, it sets the frequency. It will be clear with each change of effect, be readjusted everything! And it was easier sound unworkable (too deep reverb, pitch while ugly, shrill fuzz, tremolo all skinny, ...) used a real effect. But once you've tamed the beast, we can work something out. We are far from digital multi-effects with 128 settings instantly underfoot! Should know what to expect: As with any multi-gear, each function is smaller than what would be a unit specifically dedicated. We will not have the reverb from a Fender Twin but knowing how to be parsimonious in the Amount and the mix was very nice nice reverbs, deep snapping or playing with the tone. The tremolo is nice being, again, fairly weighted on the settings, the tone also allowing some versatility. is unlikely to say the least and frankly I do not know what they think the designer of this machine. It takes some time to tame the beasts. I see this as a collection of pedal effects "Joker" for the little extra to go out in a timely manner or with a single switch, radically change its sound. 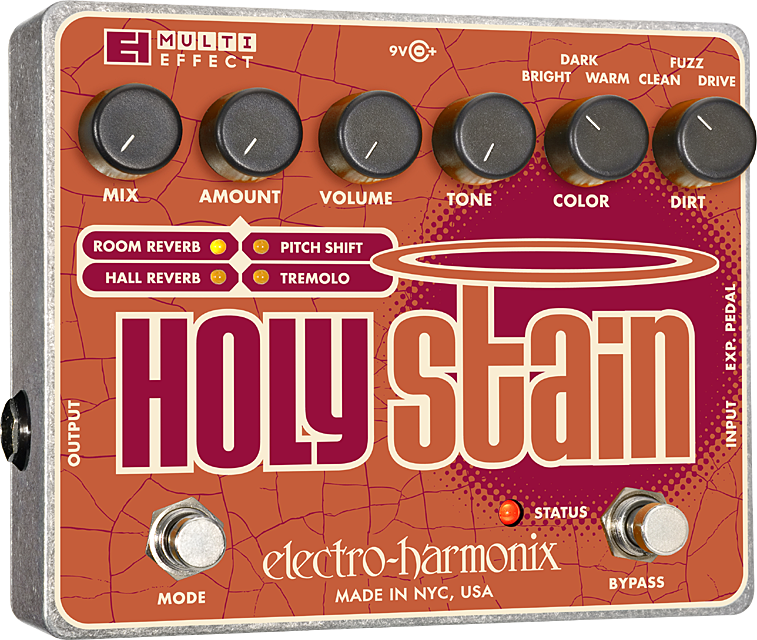 The effects are good but temperamental and I do not think this pedal suits everyone. It is like a box of Lego, which builds its heap but each turn. 2 reverbs, a tremolo, a pitch shifter. An outlet of expression pedals (as beginners are not too careful with that). Mix, Amount, Volume, Tone, Color, Dirt. 100% analog. Format XO, standard 9v power supply. For the price, it's IM-BA-TTABLE. The config is surprising to beginners. We can not combine the 4 effects: two reverbs, pitch and Tremolo. You must read the manual, because there are rglages that can not be invented, especially if you want to use the expression pedals: Amount button to the max for example. The two rverbes are extraordinary. A bit like the Holier Grail, although a little too pronounced. It binds to AC to begin and say that ADI, the price is amortized. We also said that the distos are too much, especially the Fuzz and the pitch, blah blah. It is by connecting to a PDAL Espression that is the total exploded. The pitch shifter is amazing. It's bliss, provided that the mix with the dry signal as it has a latency lgre. With the drive, it's amazing: Sorrow Gilmourn is in the pocket. The Tone knob is super efficient, egg carc'est true that the Drive and Fuzz effects are quite brutal and the tone can make adjustments. The tremolo is pure happiness, surtoiut with the expression pedals. Can be assayed speed trem and it makes gniaux effects. It is true that we must know the box and re-rgler if you change the volume of dirt. So do the math: four fabulous effects in this little magic box format XO. It's been a year since I have it. 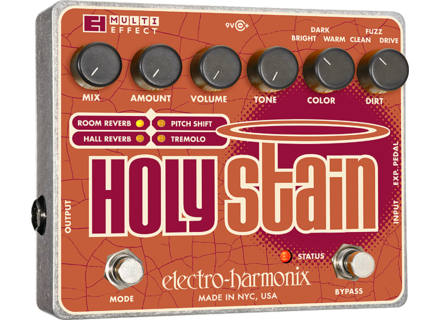 For me, the Holy Grail has become one of mesboites EHX prfres, and I possde wagon (17, the best!). DEFINITIONS and the best price for quality throughout the range. I love this box. Maximum score, a condition of investing in an expression pedals and good HP, because it sends a serious bass and Satus. PDAL In expression, Line6 EX1 works pretty well, but the top the top is the Moog EP2 just devantla MGear M-Audio EXP.